Invited To A Wedding? Read This First. Etiquette is one of those elusive things that seem to escape some people, one of those things you don’t really think about until you’re in the “10 items or less” line behind someone with a full cart of groceries, or you are waiting (patiently) behind someone who is talking on their cell phone during a really short left arrow green light, or when someone is talking really loud in a movie. It isn’t until a social event like a wedding or funeral, where things are quiet and you have time to reflect, that these infractions of common manners become so imposing. Cell Phones are the worst culprit in modern times. 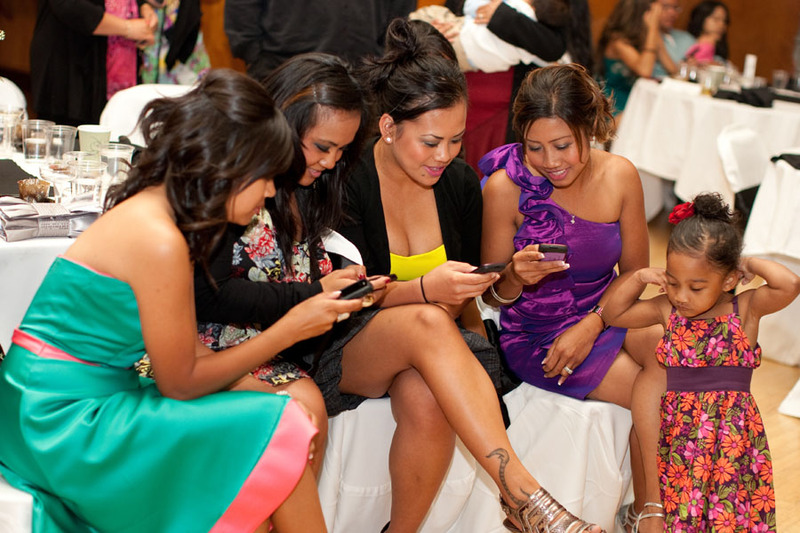 Texting, talking and (God forbid) playing games on your phone during a wedding is rude, don’t do it. 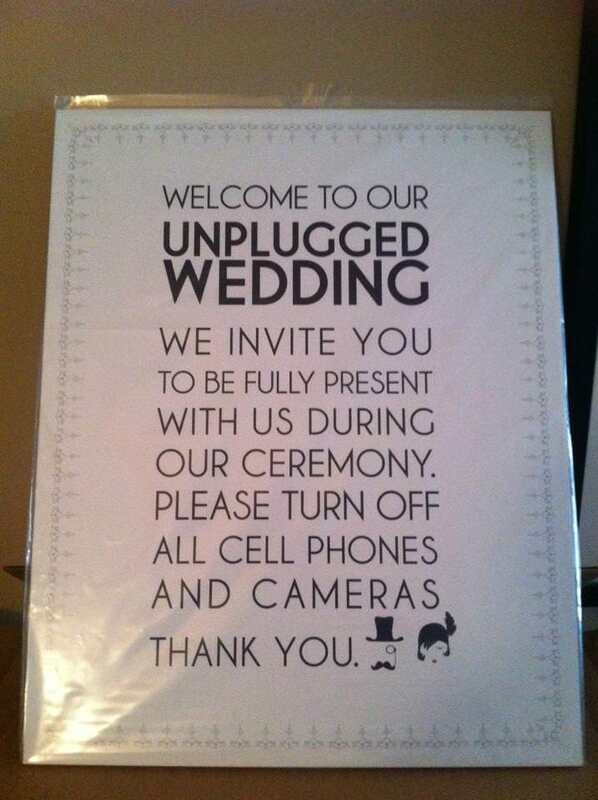 Unless you are expecting an urgent call, you don’t even need your cell phone during the wedding…. leave it in the car. If you do need your cell phone with you, turn the ringer off and carry it in your pocket, when the urgent call comes through excuse yourself and go outside where you can converse without interrupting everything. There is nothing more annoying than trying to carry on a conversation or eat dinner with someone who is glued to their cell phone. Chewing Gum is another no – no. Altoids, Tic-Tacs, Mentos work very well for a case of stale breath. 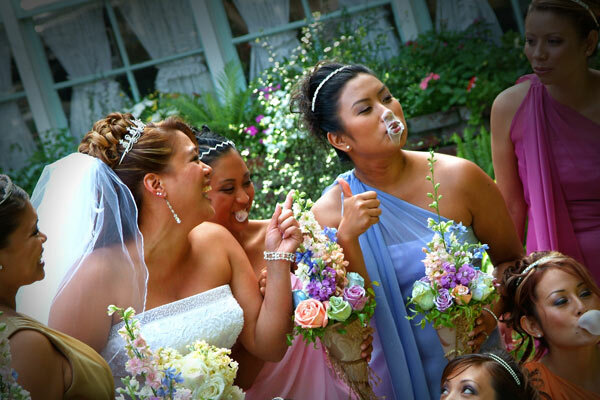 Chewing gum in church ( or other place of worship), in the receiving line, giving a toast or dancing is tacky. The worst part is when people forget they are chewing gum and it shows up in a picture…. YIKES! Dressing appropriately is hard for some people so, this is a tricky one. I sat behind a man in a hoodie at a funeral this week and couldn’t stop staring at his bright red fleece garment the entire time, thinking to myself, “Is that all you’ve got?” It was distracting to say the least. Giving him the benefit of the doubt, it is likely that he may have slipped out of work to be at this somber event and I know deep down that he had a really good reason for being inappropriately dressed. You don’t have to wear a pricey designer suits or gowns to be well-dressed. Too much cleavage, not enough skirt, anything denim are all good indicators that you need a wardrobe intervention. If you are unsure about what to wear, take a closer look at the invitation and it should tell you everything you need to know, if you are still stuck, call a wedding professional like a photographer or florist who has been to dozens of these events and they will be able to guide you. Gossip is also a touchy subject. Asking questions about the cost of the gown, reception, gifts or anything wedding related is tacky, speculating on whether or not the marriage will last is morbid, and the most glaring offense of all is wondering (out loud) if the bride is pregnant. Unless the couple has announced that they are expecting, leave that commentary for another time. Basically, you are there to lend your support, not to openly critique every detail of the wedding. Save that for late , or not at all. Let’s face it – you can’t legislate good manners. You can’t expect everyone to behave, dress, speak or act properly at all times. All you can do is lead by example and cross your fingers that they all follow your lead. By the time a person is an adult, they should know these few common rules of etiquette and if they don’t – there is nothing you can do to help them. Your best bet when faced with these offenses is to smile and politely excuse yourself from the situation. You will laugh about it later…. or not. You can check any list of the most popular first dance songs from this week, last year or ten years ago and the same songs will sprinkle the list, with a few current popular songs poking their way through to the top ten. The top ten almost always includes: Unchained Melody (Righteous Brothers), Can’t Falling I Love With You (Elvis Presley), Unforgettable (Nat King Cole), The Way You Look Tonight (Frank Sinatra) and rounding out the list, At Last (Etta James). There are a lot of other really popular songs but these are ALWAYS in the top five. Think about what relates to your relationship. One of the first steps of choosing a first dance tune is to try to find a song that matches the way that you feel about each other or relates to a past moment in your lives together. It nay not be a ballad, and that’s okay. A song that makes you connect, a song that brought you together, a song you share with one another (spiritually) and no one else. It should reflect your taste and your own personal style. Choose a danceable song. It’s important to remember that you’ll be cutting a rug to whatever song you choose. Even if you have the perfect lyric, a song with an off tempo can cause trouble. Choose a rhythm that fits your own rhythm as a couple, and make sure to practice a few times to see how you feel with the track. You may want to take dance lessons or you may be comfortable swaying to the music. Remember that most country music is 3/4 (waltz) tempo, this can be off-putting for some people. Songs that are too slow or change tempo can also be troublesome. Make it memorable. When you have your potential first dance song list in mind, think about which of these melodies will stand out to you years down the road. Pick a song that stands the test of time. It doesn’t have to be an oldie but, it should be a goodie. Talk to your DJ. Make sure you have discussed your first song with the DJ and he or she is aware of the significance. If there is some history that could be shared, that is even better! Don’t forget to let the DJ know if you want a particular version since many artists ‘cover’ classic songs. You may like the cover version better. Listen & Feel. Make sure you are aware of all the lyrics. Some lyrics will surprise you and even though it sounds like a love song- it might actually be a breakup song…. or worse. I had been dating my (now) husband for about 6 months when he reminded me that we didn’t have a song (seriously). So we sat down and went through playlists, we spent hours listening to music that meant something to us, it took several days because every song was better than the one before – plus the fact that we had to weed out the ones that belonged to prior relationships. By accident we came across a song we both loved, one that really meant something to both of us, the lyrics were perfect and we literally started dancing when it came on. It’s only funny if you know my husband. “You’re The First, The Last, My Everything” by Barry White. I get a rush every time I hear it and that’s how your wedding song should feel. Save the funny, irreverent and inappropriate songs for later in the evening, after everyone is half in the sack. Making “I like Big Butts” or “Like a Virgin” your wedding song may seem funny but, unless every one of your guests is in on the joke – you can expect some fairly odd expressions.